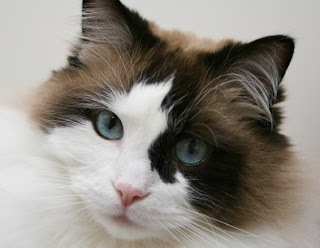 If you have a ragdoll cat, you will need to think about how to make him happy and feel comptible. GIve your full attention, it will make your ragdolla cat very happy. dont' forget to get him to the park everyday, they will very like that and you can always leave a supply of dry food out for your cat. Feeding your pet it will depend a great deal on his age. cat need to be feed three times a day. Older cats require two small meals or one large meal for the day. Kittens on the other hand, require several feedings a day until they get around the age of 12 weeks. Canned food can be feed to cats, although any food that has been left out longer than 30 minutes need to be disposed of. Cats loved canned food but Canned food is more expensive food, and you should always keep in mind that some may need to be thrown away when you buy it. you should always make sure that he has enough water, When you give your cat dry food. Dry food costs is more cheaper than canned food, and it is very good to build your cat teeth. If you have time you can make your own food, its very good for your cat, you can buy a new recipe book how to make a nutrition food for your cat. you will need to give them a brushing at least once a day. Brushing will reduce the risk of hairballs and keep your cat’s coat nice and clean. If you are keeping your cat indoors, you’ll need to have a litter box in an area that is easy for your cat to access. cat prefer for it to be nice and clean so You should always scoop it on a daily, and clean it out once a week it is because Cats don’t like to use dirty litter boxes. If you own a kitten, you should only give you kitten food designed for him. don't forget to clean and refill his water dish every day. If you forget to change and clean up the water dish, your cat will get diarhea. Treats are fine on occasion, although too many of them can cause your pet to get fat. Feeding your kitten human food is good on occasion, although you may have to mix it in with his cat food.